The CIA has confirmed an open secret: that Russia intervened in the 2016 election to help President-elect Donald Trump win the White House. The agency said the intervention was also designed to undermine confidence in the U.S. electoral system. U.S. intelligence agencies believed that as the 2016 presidential campaign drew on, Russian government officials devoted increasing attention to assisting Donald Trump’s effort to win the election, the U.S. official familiar with the finding told Reuters on Friday night on condition of anonymity. Citing U.S. officials briefed on the matter, the Washington Post reported on Friday that intelligence agencies had identified individuals with connections to the Russian government who provided thousands of hacked emails from the Democratic National Committee and others, including the chairman of Hillary Clinton’s presidential campaign, to WikiLeaks. U.S. President Barack Obama ordered intelligence agencies to review cyber attacks and foreign intervention into the 2016 election and deliver a report before he leaves office on Jan. 20, the White House said on Friday. As summer turned to fall, Russian hackers turned almost all their attention to the Democrats. Virtually all the emails they released publicly were potentially damaging to Clinton and the Democrats, the official told Reuters. “That was a major clue to their intent,” the official said. “If all they wanted to do was discredit our political system, why publicize the failings of just one party, especially when you have a target like Trump?” A second official familiar with the report said the intelligence analysts’ conclusion about Russia’s motives does not mean the intelligence community believes that Moscow’s efforts altered or significantly affected the outcome of the election. Russian officials have denied all accusations of interference in the U.S. election. A CIA spokeswoman said the agency had no comment on the matter. The hacked emails passed to WikiLeaks were a regular source of embarrassment to the Clinton campaign during the race for the presidency. 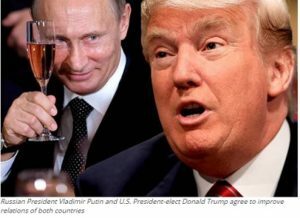 U.S. intelligence analysts have assessed “with high confidence” that at some point in the extended presidential campaign Russian President Vladimir Putin’s government had decided to try to bolster Trump’s chances of winning. The Russians appear to have concluded that Trump had a shot at winning and that he would be much friendlier to Russia than Clinton would be, especially on issues such as maintaining economic sanctions and imposing additional ones, the official said. Moscow is launching a similar effort to influence the next German election, following an escalating campaign to promote far-right and nationalist political parties and individuals in Europe that began more than a decade ago, the official said. In both cases, said the official, Putin’s campaigns in both Europe and the United States are intended to disrupt and discredit the Western concept of democracy by promoting extremist candidates, parties, and political figures. In October, the U.S. government formally accused Russia of a campaign of cyber attacks against Democratic Party organisations ahead of the Nov. 8 presidential election. President Barack Obama has said he warned Putin about consequences for the attacks.